After a campaign that promised to cleanse the country of drug crime, the new President of the Philippines Rodriguo Duterte has launched a brutal and unrelenting mission to expunge drug dealers from the country. Since he took office in July 2016, there have been nearly 4,000 extrajudicial killings of suspected drug dealers and users at the hands of police and vigilantes. Among the victims are young children and bystanders, whom the president has publicly referred to as ‘collateral damage’. At the same time, the controversial leader has shaken up the country’s diplomatic ties, calling for a split from the United States and turning toward China as a new ally. This move presents an obstacle to the United States’ efforts in the South China Sea, unsettling its position as the dominant power in the Pacific. Will president Duterte be held accountable for the mass killings taking place in the Philippines? How did the disturbing violence currently sweeping the country begin, and what does it teach us about impunity, power and the spread of violence? Chaired by Paul French, an author and widely published analyst and commentator on Asia, Asian politics and current affairs. Vladimir Hernandez has been working as a journalist for over 15 years in Latin America, covering big stories like the drug war in Mexico, the years of Hugo Chavez in Venezuela and the Kirchner rule in Argentina. Eric Gutierrez is Christian Aid’s Senior Governance Adviser, and author of the report “Drugs and Illicit Practices: Assessing its impact on governance and development”. He grew up in Manila, where he published on criminal entrepreneurs in illicit economies, and the conflict in the Muslim areas of southern Philippines. His PhD dissertation is entitled “Criminals Without Borders: Agrarian Change and Interdependency in Opium and Coca Producing Territories”, a comparative study of the political economy of illicit drugs in Afghanistan, Myanmar, Colombia, and Bolivia. Daniel Berehulak (via Skype) is an independent Australian photojournalist and frequent contributor to the New York Times. He won the 2015 Pulitzer Prize for feature photography for his coverage of the Ebola epidemic in West Africa for the New York Time and was a 2011 Pulitzer Prize finalist for his coverage of the 2010 Pakistan floods. His photography has also earned three World Press Photo awards and the John Faber award from the Overseas Press Club. 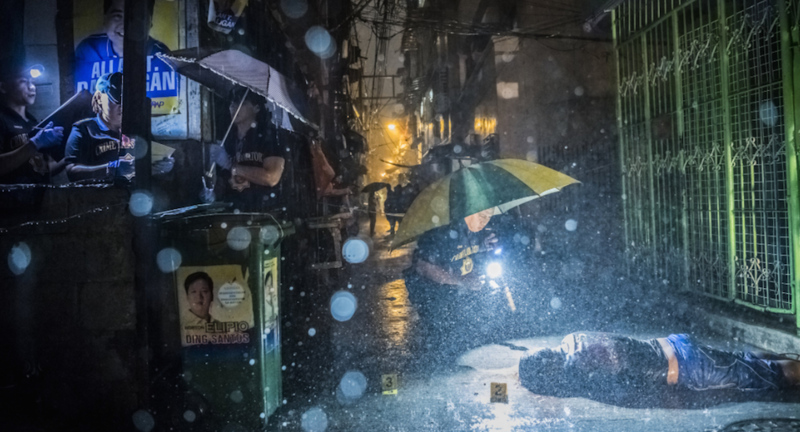 Berehulak recently spent one month in the Philippines where he covered Duerte’s drug war, photographing over 40 murder scenes. Dr Tom Smith is an academic working for the University of Portsmouths team teaching at the Royal Air Force College Cranwell. His PhD focused on the muslim insurgencies in southern Thailand and the Philippines. Since May 2016 Tom has had 5 op-eds for the Guardian published, 2 in the Conversation and the Diplomat Magazine as well as several other international media outlets including the UN Dispatch podcast, all focused on the many complex issues in the Philippines.